from the driver’s seat: my top 5 moments! Hi Folks! 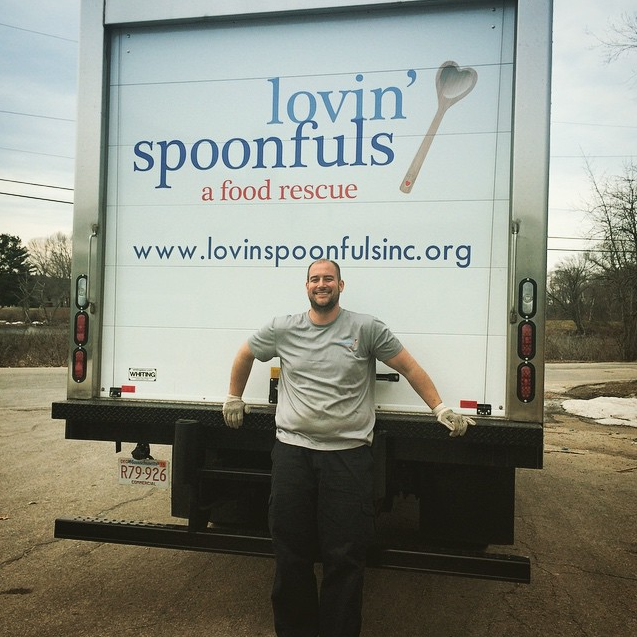 Spencer here, and now that I’ve been at Lovin’ Spoonfuls nearly two years, I want to share with you some of my best moments so far! Back in 2013, a few days before my first Thanksgiving with Spoonfuls, my fellow driver Bob Burton and I got to deliver 125 turkeys Whole Foods had donated to Harvest on Vine, a wonderful Charlestown food pantry. But we had to get them all on and off the truck somehow, so we decided that tossing the turkeys was the best (and most fun) way. 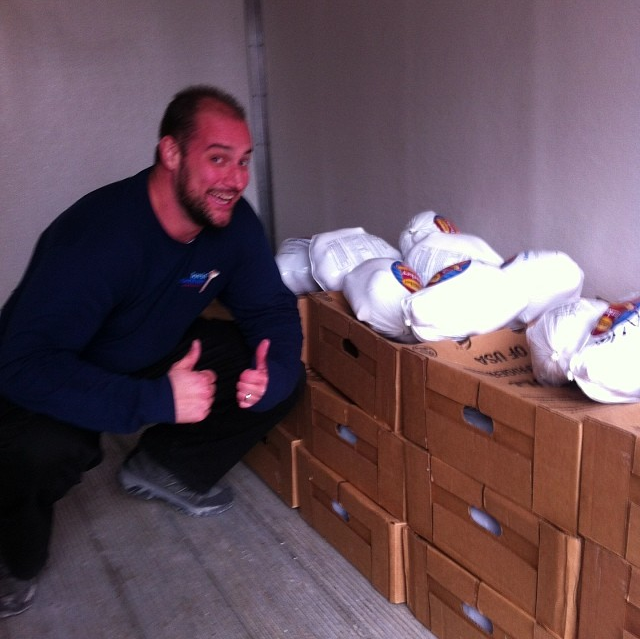 Knowing that hundreds of people in need were going to be able to have turkey dinners that holiday gave us all a wonderful feeling, and we got a good workout doing it! 2 – Celebrating the Marathon with Whole Foods! Whole Foods in Wellesley has a loading dock that is on the Boston Marathon route, so we weren’t able to make a collection on the day of the race last year. Being the first marathon since 2013, everyone tried to bring as much positivity to the day as they could. And what an amazing day it turned out to be! 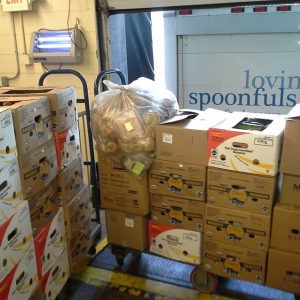 Adding to what makes our community so awesome, WF had over a ton of food for us to collect the next day! 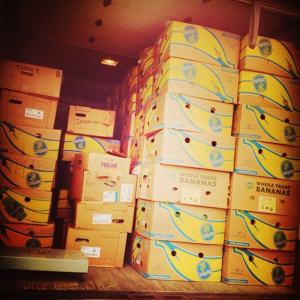 That food went a long way to helping families in need. 3 – 4800 pounds in twelve hours? RECORD!! Sarah had been with the company for just a few weeks when she and I hit the road together for the first time. For some reason, everyone had huge collections that day, and we had to do a night haul at the Dewey Square Farmer’s Market as well. I really was hoping she wouldn’t get scared away by having to haul that much in one day, and I’m happy to say that we pulled it off just fine! She’s been on the team over a year now, and we’re so grateful to have her. 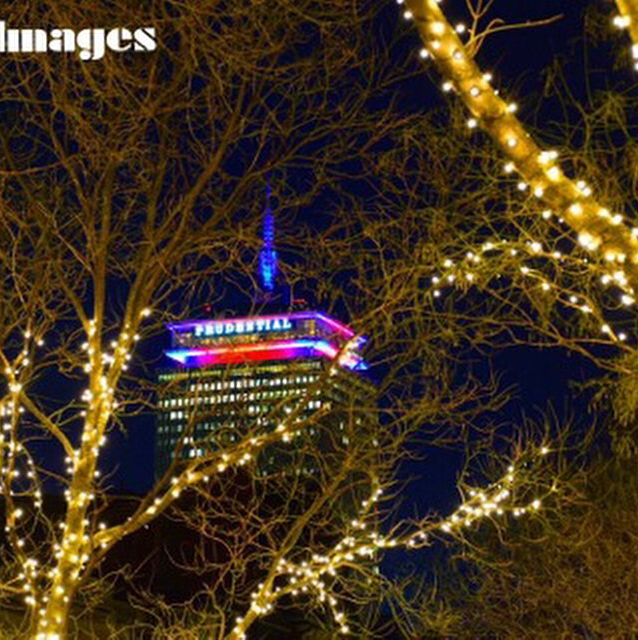 Each December, The Prudential Center honors non-profits in the area by lighting up in their colors for one night during the holiday season. We were lucky to be on that list, and I was able to spend a few hours at The Pru with the team, talking to shoppers and passers-by about what we do, alongside our pals from SWEET who brought delicious cupcakes for everyone! As I was walking home, I got to see that staple of the Boston skyline lit up in honor of an organization that I believe in, and of which I’m proud to be a part. What a beautiful sight! Also, I love cupcakes. 5 – I have the best job in the world. While I was trying to put together this list, it kept occurring to me that the individual instances are great, but the really wonderful thing is being able to bring healthy, nutritious food to those in need on a daily basis, while working with some of the most wonderful people in the world; in other words, just doing my job. So many people, not only at Lovin’ Spoonfuls, but at all of the agencies we work with have become a beautiful part of my life. There are the people at Trader Joe’s in Needham, Whole Foods in Wellesley, Hannaford in Waltham, Catholic Charities in Dorchester, The Boston Rescue Mission, The Sojourner House in Roxbury… the list goes on and on. I get to see these people every week and thank them for their involvement in this cause! I’m blessed to do what I do.